A great modification on the Audient ASP4816. I’ve recently put together a new studio. I’ve had a couple of studios over the last 20 years and I’ve been lucky enough to work in some “big” studios with world class, Grammy winning engineers on a few of the classic large format consoles. Most of my time is spent writing and recording my own material (when I’m not playing live) and my own studio has always been primarily a tool and creative space for my own work and amusement. When I started to plan the new studio I wanted it centered around a good analogue console, something worth plugging in to. A few folk suggested digital consoles and I certainly see the benefits but that’s just not me, if I was going to do that I think I’d be plumbing straight into the DAW. The multicore connecting my live room and control room is old school analogue and nothing goes digital until it hits my Mac running Logic Pro via an Orion Antelope. (The Antelope was a fantastic suggestion from my kit guru Adam Crowe at Funky Junk… he’s a legend.) My budget was modest but not entirely restrictive and Adam pointed me towards the Audient ASP 4816. He knows how I work and that I like to have everything at my finger tips and ready to go rather than faffing around with patch bays. The 4816 gives me a plethora of switchable inputs and routing options. The pre-amps are clean and true. The physical footprint of the console isn’t prohibitive in a room that can’t accommodate bulkier consoles. What’s more it looks great and a console is always a lovely visual focal point in a studio. You can read up on new gear all you like but it’s not until you get it under your fingers in your own working environment that you really figure out how it will truly integrate into your workflow properly. I’m a musician and a writer, I need the kit to be as simply functional as possible so I can concentrate on composing, playing and tracking without being slowed down by gear. The ASP 4816 has a lovely feature allowing you to route the long fader to the short fader, which is a great help to me. I can use the long fader for setting the level sent to the DAW and the short fader for my monitoring level whether that’s from the live room via the long fader or the return from the DAW. I can mess with the monitoring all I like and not affect the record levels. However the short fader is post fade, which is fine, but in my ideal world it would be pre fade so the monitoring level and recording level are independent. Here’s the great thing: a small modification on the circuit board allows you to do this. Tom Waterman from Audient (another hero and a man of infinite patience) very kindly made this mod and it’s made a significant difference to my workflow. I’m fairly certain there’s not much on the market at this price point with these sorts of features. The Audient ASP 4816 is exceptional. 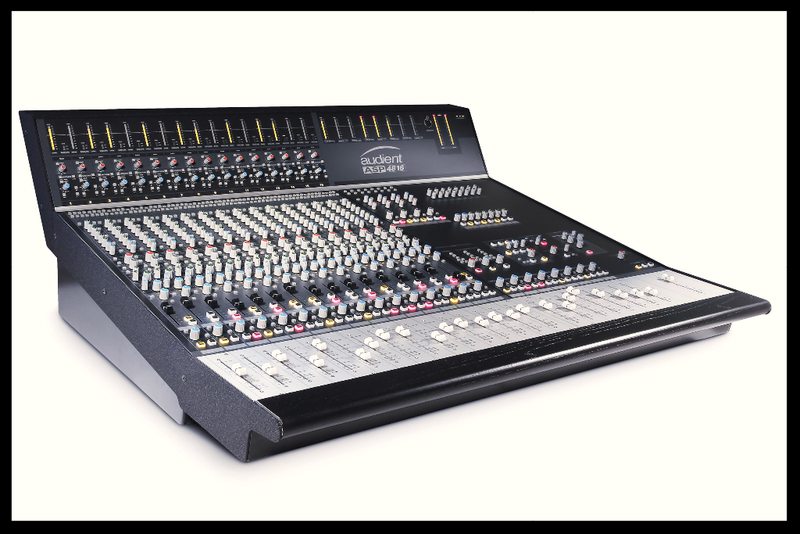 Straight forward and easy to navigate, sounds great (the EQs are quite a treat) and is intuitive and comfortable under your fingers. The service from Audient is very personal, I can’t thank Tom enough. If you’re looking to buy a “small large format” console you should very seriously consider the ASP 4816 and look into some of the small but significant options that are available and easily over looked… and talk to Adam at Funky Junk, what he doesn’t know about kit isn’t worth knowing. Both Tom and Adam are great company to sit and have a cup of tea and a chinwag with too.